To "protect" society from the dangers of unlicensed lemonade sales, the New York Department of Health shut down a little boy's summer project. Ballston Spa, NY — As 2018’s summer of snitches continues, a story out of New York shows just how well the see something say something propaganda is working on society. Multiple vendors at a state fair in Ballston Spa, New York called government officials last month to have a nearby lemonade stand—run by a 7-year-old boy—shut down. 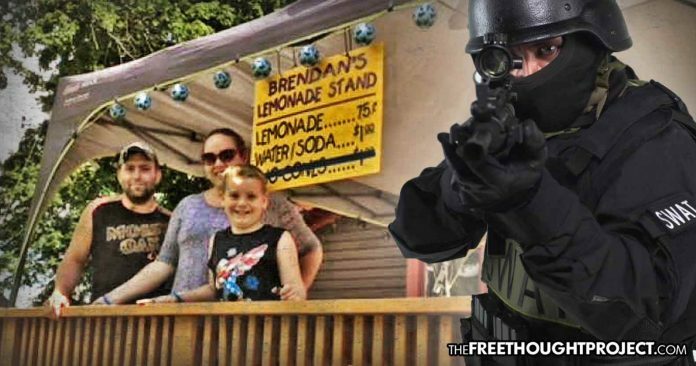 As TFTP reported in June, the Country Time lemonade company launched a campaign pledging to pay fines and permit fees for young entrepreneurs who are reprimanded by the police state for their harmless refreshment stands. The story below proves why that campaign was so desperately needed. The vendors who called the state Department of Health were either completely brainwashed by the state into thinking the boy was committing a crime, or they—like so many other corporate welfare leeches do—were using the state to shut down their competition. Either way, the state did their part. As the Times Union reports, DOH spokesman Gary Holmes said that one of the department’s inspectors closed down the stand at the entrance of the Saratoga County Fair after four separate vendors complained about it. Holmes told reporters that all of the vendors called to ask if this little boy had the proper permit to operate the lemonade stand. The young entrepreneur, 7-year-old Brendan Mulvaney, did not have the proper permit to sell lemonade—so the state shut him down. Sean Mulvaney, Brendan’s father said he believes the state is trying to cover for its employee. On Monday, the state issued an apology to the boy. However, sticking with their guns, they noted that the boy still needed a permit to sell lemonade. Mulvaney explained that his son was selling lemonade for 75 cents and if he was forced to get a permit, he would have to sell it at the fair’s pricing which is $7. How, exactly, a $30 payment to the state would protect people from anything remains a mystery. The news even made it to state Senator James Tedisco, who visited the boy and surprisingly called for the state of New York to keep their noses out of Brendan’s business. According to the Times Union, Tedisco said he’s going to demand the DOH pay for the boy’s lost profits. As Reason magazine points out, perhaps these politicians can direct some attention to the state’s burdensome occupational licensing and training programs that do the same thing to adults that the health department did to a 7-year-old. The Institute for Justice notes that becoming a barber in New York State requires two and a half years of professional training. Becoming a child care worker requires a year of training, more than in any other state besides New Jersey. Although Brendan was shut down, at least he escaped without a fine, other children who’ve dared to sell the cool lemony goodness without a permit haven’t been so lucky.